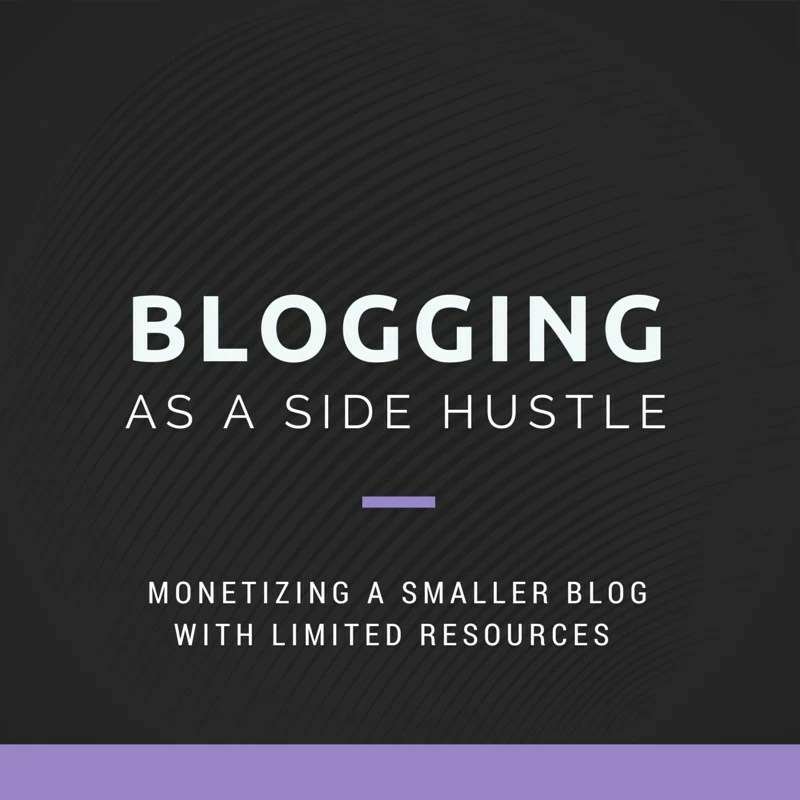 Looking to earn a little extra income with a side hustle blog? Check out these many manageable ways a small blog can earn a little extra cash. Countless opportunities to monetize a blog exist. The best creative minds have developed amazing ways to find financial success from their platform. As a modern mom with a nearly full-time job and side hustle of a blog, I’m not pursuing monetization in the same capacity as some other bloggers. The time and financial resources I’ve committed to growth and development of my blog don’t support most full-fledged monetization schemes. Truly, I write first and foremost for myself and my readers about things that strike a chord with me and, hopefully, my audience. That doesn’t always lead directly to the most profitable opportunities. Down the road, I may explore other options. But for now, I want to focus on streams of potential revenue that work for bloggers like me who have smaller followings and limited time to dedicate to growing and managing their online platforms. With that, I thought I’d share my two cents (based only on my own experience) about various monetization methods that may or may not be suitable for smaller blogs with limited or niche audiences. Here’s just one perspective on how one might make a little extra spending money blogging as a side hustle. Google AdSense ~ This ad networks offers a space on your page for advertisers to bid on showing their ad on your blog. Google does all the heavy lifting in the background. You get paid based on some algorithm of views and clicks.While you won’t likely be making enough money to pay your mortgage with this method, it’s super easy to set up and takes zero effort to maintain. So for the initial investment of fifteen minutes to set up the add, you can earn a very passive small income stream to help cover some of the costs of running the blog. For me, this option was initially a no-brainer. Various display ad networks are available, but I haven’t explored them and don’t think it gets any easier than Google AdSense. For smaller blogs who want ads, Google Adsense is probably the best way to go. I also don’t think it makes a ton of sense to pursue more than one. You’ll end up with too many ads on your page distracting readers (and ultimately sending them away from your blog when they click on the links). Over time, my perspective on use of ad networks has shifted. I maintained Google Adsense on my blog for a couple of years. But with lower traffic than the big blogs, I didn’t find the financial benefit to be worth the distraction my sidebar. I don’t currently have any ad network ads on my blog, and don’t plan to use them in the foreseeable future. As an affiliate of a brand, a publisher promotes a product or service and, in return, generally receives a commission on any sales generated as a result of that promotion. Affiliate relationships can be managed directly with brands or through networks. Direct affiliate relationships tend to be more profitable for publishers but also require more investment in finding them and managing them. Typically, a company or brand has an established affiliate program that the publisher signs up to participate in and receives a unique tracking link for earning commissions. I have a handful of direct affiliate relationships with brands I really like and make sense for my readers. Affiliate networks facilitate a relationship between publishers and marketers and create a one-stop-shop, effectively, for publishers to establish connections with various brands under standardized commission and compensation arrangements. Affiliate relationships can be quite profitable if they are the right fit for the publisher and suitable for the audience. But without significant traffic, most affiliate relationships won’t amount to significant dollars. However, if you have a few products, services, or brands that you really love (and think your readers would love – that’s the key! ), consider establishing affiliate relationships with these brand directly or through their selected affiliate networks. Through these affiliate networks, you can link to specific products in your post and include banner ads on your blog that track referrals from your blog to the brand’s site. Many affiliate networks abound, and here are a few that I’ve explored. Each has their own set of hundreds of brands that you can work with through their channel. Share-a-Sale ~ Very similar to Ebay Enterprises with a wealth of vendors from which to choose across lots of industry and niches. Amazon ~ If you can buy it on Amazon, you can generate a link to share it on your platform and earn a commission if someone buys it. After signing up for the program, you see a menu bar along the top of the Amazon site when you sign in that allows you to turn just about any product into a tracking URL with your referral ID. Super easy! Others I have explored but don’t currently use are CJ Affiliate, Rakuten, Collective, and rewardStyle, among so many more. Various organizations such as those listed below bring together publishers (also called influencers) and brands or marketers in a way similar to affiliate networks. In this case, however, publishers generally apply to write content about the brand in exchange for product or compensation. Many such networks exist though not all accept or are effective for small blogs. I have worked with several and they all have slightly different methodologies for how influences are chosen for particular opportunities. They also tend to have somewhat different types of brands they represent. The following list is not all-inclusive but includes several I have worked with during the last couple of years. IZEA ~ This platform regularly provides a wide variety of sponsored post opportunities. They email with new opportunities that potentially fit your profile. They have a pretty unique web-based portal through which content must be submitted for approval prior to posting. It took playing around with it and doing a couple of sponsored posts to figure it out. For the first six months or so working with this network, I had some success. But in the last 18 months or so, I haven’t had much luck finding good opportunities. This could be a reflection of the niche in which I write. WeaveMade & Pollinate Media ~ Sister companies (Pollinate Media targets larger blogs), WeaveMade caters to smaller blogs, generally with about 10,000 – 20,000 page views per month. I have worked with both of the sister companies. They are generally easy to work with, though I don’t see too many opportunities come from them. That could be a facet of my niche or the size of my audience. Overall, it’s been a worthwhile investment of my time to become a part of the community and apply for sponsored opportunities on occasion. Collective Bias / Social Fabric ~ These are two sides of the same company. Collective Bias manages the brand relationships and Social Fabric is the influencer community that provides content for campaigns. I really like Social Fabric. They have a very large community and many people apply for campaigns and don’t get accepted. While that can feel frustrating sometimes, they also offer an array on resources on becoming a better blogger (podcasts, videos, lessons and tutorials, etc..). Influence Central ~ Not as large as Collective Bias, this network offers similar opportunities (though not as many) to propose an idea for a selected brand and then be chosen from a population of applicants based on the brands preferences. Linqia ~ Unlike many of the other networks which pay a fixed fee for posts, Linqia pays based on performance of the post. I think the payouts tend to be slightly lower for this network than some of the other networks, they offer different opportunities and are another avenue for campaigns. I have liked working with them to date, have completed a few campaigns with them, and will continue to work with them for the foreseeable future. Further Reading: After writing many pitches for sponsored posts (and getting quite a few acceptance as well as plenty of rejections), I wrote a post all about what goes into submitting a pitch to a brand or sponsored post network. Early on, I didn’t pursue these opportunities because I expected them to be fairly time consuming. As of late, I’ve found that they can be really great alternatives when I want to try a product I think would be great for my readers (i.e. I get paid in product instead of cash) or I really love a product and can connect with them directly. It can be a great way to get to know a brand better as well. Inspired by the 100 Rejection Letters project (I’m not a paid member of the program), I have set out to try this myself. I track all the times I reach out to brands directly as well as mark yes and no responses. I have been surprised how often I get a ‘yes’ and how reaching 100 rejection letters can be. But it’s been a fun and rather productive exercise as I continue to build relationships with brands in my niche. For reference, I’ve included a list of some other income streams below. I haven’t explored them so I won’t go into much detail about them. For me, they require more time commitment than I have available at this point in my blogging journey. But if something piques your interest, certainly search the web for more information on it. At the end of the day, it’s all for naught without good content. No one will view your display ads, click through your affiliate links, read your sponsored posts, or hire you otherwise, if you don’t offer amazing content for your readers to eat up regularly. As publishers with smaller followings, it’s of the utmost importance that we create meaningful and engaging content to attract and grow a loyal audience. So pick a couple options and experiment, but spend the majority of your time focusing on making your publishing platform an awesome place for readers to land and stay a while! And check out my Pinterest Business of Blogging Board which includes many great links to all sorts of blogging resources, guides and tutorials, including many about monetizing your blog. Want more ideas about where to find great inspiration for all that important new content? Check out the post I wrote about various tools and resources I use to streamline my blogging process and make it more enjoyable. Got questions? I’m more than happy to answer them. Note: All logos included above are property of the respective brands / companies. I have included them only to share with you about their products and services. Did you find this helpful? If so, I’d love for you Pin It or Share It with friends and followers!